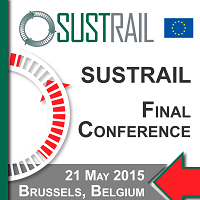 On behalf of the SUSTRAIL Consortium, UNIFE and UIC have the pleasure to invite you to the Final Conference of the SUSTRAIL Project to be held at the Royal Flemish Academy in Brussels, Belgium on 21 May 2015. Launched in June 2011 and ending on 31 May 2015, the SUSTRAIL project is a four-year collaborative R&D project co-funded by the European Commission within the FP7, with the overall objective to support the freight railway in regaining a primary position in freight transport. This event will be the opportunity to discover the main achievements of the project. It will also be the occasion to be informed on the exploitation of the project results. Click on the icon below to download the provisional programme. This event is completely free of charge. To secure your place at this important event, register for the event by filling in the form below and click the Submit button to send your registration. To attend the official dinner on 20 May 2015 at 19:00, please fill in the second form. Participants in the conference are invited to participate in the official dinner on 20 May at 19:00. Fill in the form below if you would like to join. More information on the dinner venue will be sent to registered participants. Important: We advise you to make your travel arrangements (trip/hotel) early.